The PUMPHRP11-12 is a reversing pumpset designed to interface the NavPilot 500 Autopilot with a hydraulic steering system. The pump assembly incorporates a reversible gerotor gear pump, a two-piece gear housed in an eccentric ring. This allows for incredibly quiet, reliable and precise operation. The output flow rate of the pumpset determines the speed of the steering cylinder. 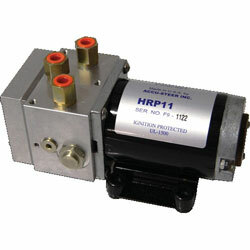 The PUMPHRP10-12 outputs 1 cu. in. of oil per second and requires a 12VDC input. Functions: Wind Speed and Angle, Arm Length: 28.3"